As Valentine's Day approaches, many of us are looking at love through rose colored glasses. The truth of the matter though, is that love is hard work. And there are battles to be fought. Not at each other, but for the sake of your love. And, if you want to win those battles, you are going to have to fight for it....together. Every 6 months or so, I try to do some research and find a new book on Christian marriage that is applicable to us. I usually read the whole book and on occasion, Ian will to, though sometimes it's just excerpts or chapters that I think are especially powerful. 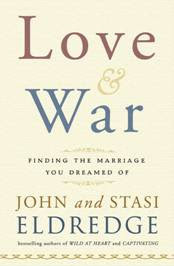 Enter, John and Stasi Eldredge's "Love & War." "LOVE & WAR shows couples how to fight for their love and happiness, calling men and women to step into the great adventure God has waiting for them together. Walking alongside John and Stasi Eldredge, every couple can discover how their individual journeys are growing into a story of meaning much greater than anything they could do or be on their own"
I really loved how this book looked at different scenarios from both husband's and wife's perspectives and how they emphasized the spiritual warfare that goes on within a marriage without us ever knowing. Their emphasis on praying together and becoming aware of what is bothering you opened my eyes to things immediately in my own marriage. Marriage "is like taking Cinderella and Huck Finn, tossing them in a submarine, and closing the hatch." If you're interested in "Love & War," I would highly recommend it! You can get it HERE. Also, if you are interested in Blogging for Books, WaterBrook Multnomah's program where they provide books to bloggers to review, check out their website and apply HERE. Ok, I'm totally gonna have to check out that book. I spend a lot of time reading Christian fiction but I've decided I should fill some of my time with reading good solid Christian teachings. Thanks for sharing! I saw this book today at the local bookstore. I was tempted to look at it, but am trying not to spend toooooo much money on anything right now so I moved onward but I might have to make an exception now that I've read this review. that looks like a wonderful book! I loved "Captivating," so I can't wait to read this one!